At West Georgia Vision Center, we strive to meet all of your eye and vision care needs. Corrective lens evaluations and prescription management are provided by our doctors in LaGrange. After a comprehensive eye and vision evaluation, Dr. John Whitlow or Dr. Donna Whitlow will discuss the variety of contact lens options with you to select the type that best fits your vision needs and lifestyle. If you suffer from dry eye, allergies, or recurring eye infections, speak with our staff to determine whether contact lenses are right for you. Prior to prescribing contact lenses, Dr. Whitlow determines what level of vision correction you require. Refractive error (commonly known as nearsightedness, farsightedness, or astigmatism depending on the error) is evaluated by measuring how the eyes focus when a series of different lenses are placed in front of them. An optometrist may use a phoropter and/or an automated instrument to take these measurements. After determining the level of refractive error, Dr. Whitlow works with you to determine whether contact lenses or glasses are best for your lifestyle. If you suffer from certain conditions, such as dry eye or allergies, glasses may be the most comfortable corrective solution. Contact lenses are available in either soft or rigid gas permeable form; there are advantages and disadvantages to each. Specialized contact lenses, such as bifocal contact lenses (for those who need bifocals or reading glasses) and contacts that correct astigmatism, are also available for patients with special eye conditions. 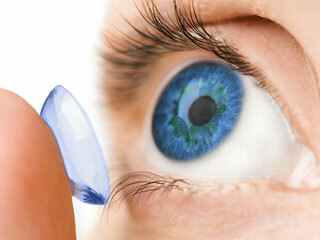 The replacement of contacts varies: daily, weekly, bi-weekly, or monthly, depending on what type of lens you select. Disposable daily, weekly or bi-weekly contacts are often recommended as a healthier option with frequent replacement preventing build-up of protein and bacteria. Additionally, since daily disposables are discarded at the end of the day, there is no need to buy contact lens solutions for cleaning and storage of daily disposable contacts. Advances in contact lens technology have created great options for cosmetic and prosthetic lenses. Custom contact lenses can be created to camouflage any color variation or irregularity and produce a natural eye color. Cosmetic lenses are also available to transform or enhance your eye color. Colored contact lenses can change brown eyes to blue (opaque lenses), or make blue eyes "bluer" (enhancing lenses). If you are interested in trying on colored contact lenses, AIR OPTIX® COLORS has astudio which allows you to virtually try on different colored lenses. You can even upload your own photo! Have fun and click here. There are even contact lenses available for special occasions like Halloween or cheering your favorite team! It is important that you have had a proper contact lens fitting to ensure your contact lenses are safe and comfortable. The American Optometric Association has issued a warning regarding the use of popular Halloween contacts and permanent damage to eyes when purchased without a proper medical evaluation. Call us at 706-882-0616 and speak to our knowledgeable staff if you are interested in modifying or changing your eye color with contact lenses.